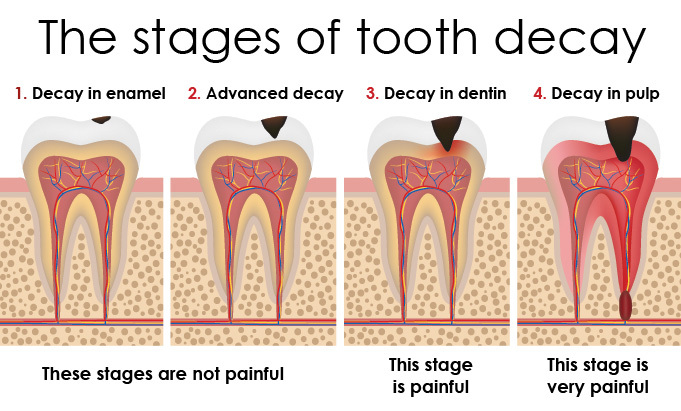 Tooth decay is deterioration of the outer layer of a tooth, specifically the enamel. When this transpires, the enamel is weakened and susceptible to infection and other damaging conditions. The breakdown of teeth shows in the form of cavities. Professional dental treatment is required to treat tooth decay and prevent further injury to the tooth. A typical cause of tooth decay is the consumption of food and drink. Sugar and starch cling to teeth after eating or drinking. Foods containing these ingredients, such as candy, dried fruits, soda, and alcohol, adhere to teeth and cause cavities. Tooth decay is also caused when plaque forms on teeth. It is a sticky film that results when bacteria, acid, saliva, and food debris combine. Over time, plaque builds up on teeth, weakening the enamel of the tooth. If not cleared away by brushing or cleaning, it will lead to decay and eventually cavities. Choosing not to brush teeth every day has its consequences. Tooth decay is a result of poor oral hygiene, as the buildup of plaque and bacteria can cause deterioration. Certain prescribed medications, as well as cancer treatments, can contribute to tooth decay. They are known for causing dry mouth and impacting the composition of saliva. Also, medical issues, such as eating disorders, diabetes, and cancer, can lead to deterioration of the teeth. Why is It Affecting U.S. Citizens? U.S. citizens are vastly affected by tooth decay, caused by poor oral hygiene, inaccessible dental care, and a lack of awareness surrounding good dental practices. The age group most affected by cavities is young children, as 53% of children 6 to 8 years of age have cavities. Further, over 40% of children are affected by tooth decay by the time they reach kindergarten. As for adults, data indicates that 1 in every 2 adults is affected by periodontal disease. And 1 in 4 adults, aged 65 and older do not have their original teeth. These findings highlight the concerns around national dental and health care. At Premier Dental, our team is committed to helping patients better their oral health. Through education and the implementation of oral procedures, our goal is to support patients on the recovery of their oral health. We aim to improve their dental conditions and make dental care accessible. To book an appointment with our Lee’s Summit dental office, contact us.